Do you have a happy place, a special source of joy that uplifts your soul every time you are there? Let me tell you about mine. 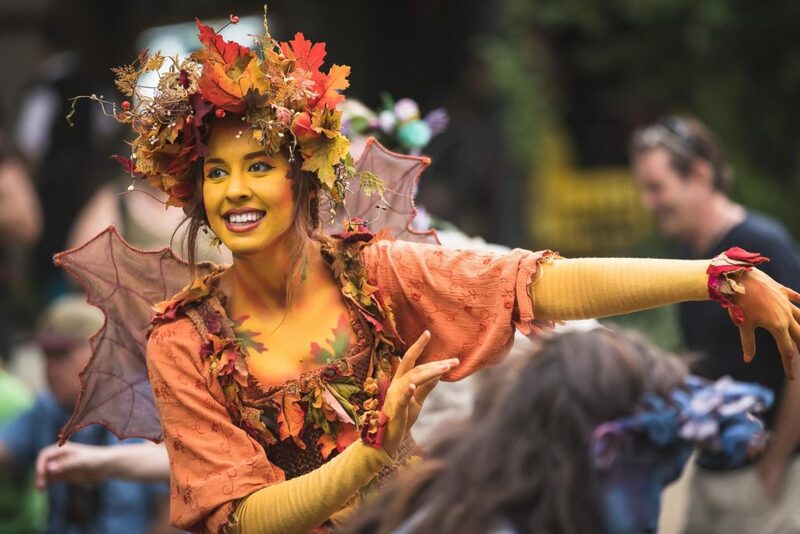 The Bristol Renaissance Faire is a make-believe 16th-Century English village that recreates a day when Queen Elizabeth has come to visit. Bristol is located within sight of the world of concrete roads, orderly outlet malls, and generic motels that cluster around Interstate 94 just north of the border between Illinois and Wisconsin. From the road, Bristol looks like a patch of green wood enclosed by a fence. Bristol is in the world but not of the world. The world of Bristol is a tangle of trees, dusty lanes, cozy wooden shops, elaborate stages, still ponds, glades, and meadows. Entering Bristol requires visitors to pass through a set of gates, like the Pevensie children entering Narnia through the doors of the wardrobe. My family and I have been visiting Bristol for years. My daughter, Marion, and I are now part of the cast of actors who become Bristol residents for Saturdays and Sunday during the summer. I have often been asked why on earth I choose to dress in heavy 16th Century garb and drive two hours round trip on Saturdays and Sundays to bake in the summer heat. I have offered some answers through my blog during the past few years. But my posts are, at best, clues, as is the one I’m writing now. For Bristol is a mystery, like a rune that casts a spell on you. Bristol is a place of strong magic, like Middle Earth or the island in Lost. Over the years, I have experienced the setbacks that beset you if you hang around long enough, ranging from job loss to death of family and friends. Bristol is a healing balm. Early on Saturday and Sunday, long before the gate opens, and before many of my cast mates arrive, I walk through the trees that stand like guardians beside a private lane where cast members enter the grounds. I feel the trees whispering to me that the time has come to put aside all the world’s cares and surrender to Bristol. The spell of Bristol grows throughout moments of the day, like when I walk past the fairy village in the morning. The miniature buildings and trees of the village are set off from a meadow by a little fence, seemingly still but humming with energy. Or when I smell wood smoke and notice white wisps rising from cooking pots simmering in the open air at the Dirty Duck Inn across from the Cheshire Chase Action Stage. The day brings more smells, sounds, and sights. Like the drone of a hurdy-gurdy in the distance as you stroll down the wide expanse of High Street and Shoplatch Lane. The harmonic voices of the Bristol Buskin Frolic dance company or the jingle of the bells on their feet as they walk by. The sight of fairies, their faces painted yellow, green, and blue, dancing amid the trees or hiding in bushes. The shadows that fill Shakespeare’s Meadow, creating tall, animal shapes that dissolve in the trees. In the evening, I sometimes detect a splash of incense wafting from the shops, like a natural perfume in the air, which energizes me during moments when my body grows tired from having roamed the streets all day, interacting with patrons as I portray a character named Nicolas Wright. When you visit Bristol as a patron, you can easily spend hours bouncing from one attraction to the next: the knights jousting, the comedy shows, the musical troupes, the Danse Macabre, the shops selling silver rings, ancient maps, and wooden swords, among other things. The street improv acts create an energy that can keep you buzzing all day. As a cast mate, I enjoy all those things as much as I did when I was a patron, but I also appreciate the quiet moments when I savor life as I did when I was a child and things were simpler. Like lying in the grass behind a tree and studying the clouds before the mid-day parade begins. Or letting a breeze wash over me during a mid-afternoon lull in the hidden garden of the noble’s glade. Or following the graceful, swooping motions of a falcon after the creature is unleashed by royal falconer. Little moments that deepen the spell. The spell works its way through the cast and also the patrons, like Daniel, a military veteran who I’ve occasionally encountered in the streets. He is quiet, barely saying a word as he moves slowly from shop to shop. Normally he wears sunglasses and a cap with the name of his military unit stitched on the front. We sometimes trade smiles and small talk in fleeting moments. One time in 2014 he told me that Bristol is his happy place, where he walks off his memories of fighting in the Middle East. He thanked me for being part of the magic that heals him. I never forgot that conversation — what he said, where I was standing in the shadows of Guild Hall Row when he confided in me, and his sunglasses and cap. I didn’t see much of him in 2015 or this year, until a few weeks ago, when I was marching in the mid-day parade. The parade snaked its way through Bristol, all of us kicking up little eddies of dust. As always, I made brief eye contact with a sea of faces, waving and shouting. Near the lane, I noticed a familiar, quiet grin behind a pair of sunglasses. I did a double take. I knew that face — Daniel’s, without the cap. “I know you!” I shouted. His grin became a broad smile. “You will always be my friend!” I continued, as he disappeared from view. Seeing Daniel filled my soul. He looked happy and healed. I wondered if I would see him that afternoon. You can see someone for just a moment in Bristol and never again. Every second counts. But a few hours later, at St. John’s Crossing, a little lane of shops and food stands, there he was, wandering alone. I held out my arms, and we embraced like brothers. Not a word needed to be spoken. Everyone on the cast can tell you stories like mine. I hear them every day — tales of people transcending the world that sent them into Bristol, through encounters with Queen Elizabeth, learning how to country dance, or meeting a knight. These are but snapshots of a place, flat images that capture a glimpse of something unknowable. Magic cannot be known. Like faith, magic requires belief. I believe in Bristol magic even though I do not understand it fully. I am grateful that I have a place in my life for the unexplainable. This entry was posted in Entertainment and tagged Bristol Renaissance Faire, David Deal, Superhype. Bookmark the permalink. Chuck sent me to your blog straightaway as soon as he\’d read it. You captured beautifully the magical feeling that permeates every dusty corner of Bristol. Your story of the veteran was touching. So wonderfully written. Huzzah! Thank you! It is difficult to capture so many impressions that flood my soul every Saturday and Sunday, but I figured I would try to share a few. I appreciate your commenting! LOVE this beyond words! Thank you for being part of that magic for me ~ I\’m always happy to see your smiling face as I make my way through the village. Thank you! The pleasure is all mine. This post barely scratches the surface. What a happy place. My husband will never come to faire. He\’s BEEN to faire, pre-season, when he delivered benches for the Garden and some other woodenly things to the Queen\’s College. But because of his disability (he had a stroke when he was 28 years old), he won\’t come to faire on a faire day. Too many people, too much, over-stimulation makes him shut-down and he would be miserable. Even without being THERE, he gets it. Thank you so much for sharing, Patty. I am so pleased that your husband sees the happiness on your face, which must speak volumnes! So well stated! I have been coming to Bristol since the late 80\’s (the year before Dawn was Queen). For most of those years, I went in garb with a persona and with me magical dog, Percival. For various health reasons, I have dropped the garb and persona the last several years, but still go several times each season for the music and people-watching. My husband would say, \”I went once, why would I go back?\” and \”It\’s just escapism.\” There\’s nothing wrong with a little healthy escapism in today\’s world (as long as you can reenter the \”real\” world on Monday). Besides, it\’s just plain FUN!. And your comment is well stated! Sometimes I take a break in the Friends of Faire area and people watch, which is one of my favorite things to do. Yes: just plain FUN sums up the experience perfectly. Thank you for this. I miss \”my\” faire terribly and your snapshot took me right back to the magic. Thank you so much for commenting! I know everyone has their own favorite memories. What are yours?